A happy product of an international collaboration between the Asia Pacific Advanced Network (APAN) and the US National Science Foundation (NSF), the TransPAC Pacific Wave 100G will be able to keep up with the large data sets fueling today's scientific discoveries. 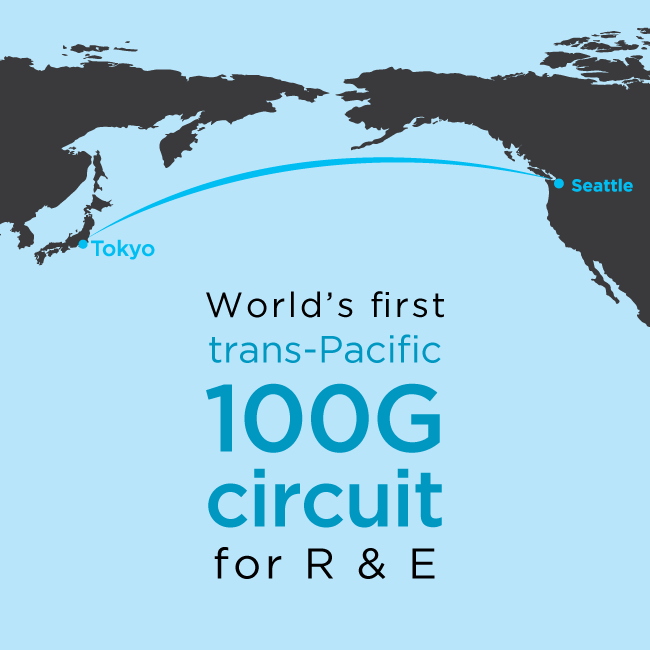 TransPAC Pacific Wave 100G is the 1st 100 Gbps R&E network connecting US and Asia. Faster data flow means faster discoveries. Japanese professors can now join Pacific Research Platform. Slow internet connectivity can really mess up your Netflix, but when scientists experience slow internet speeds, the whole world’s knowledge is delayed. Luckily, collaboration between the US and Asia has enabled the world’s first 100 Gbps circuit connecting Pacific Rim research and education networks to their counterparts in the US. Called the TransPAC Pacific Wave 100G, the new link connects network research hubs in Tokyo and Seattle. The new circuit is funded through a US National Science Foundation (NSF) grant for the TransPAC4 and Pacific Wave projects, and is a collaboration between Indiana University, the Pacific Northwest Gigapop, the Asia Pacific Advanced Network (APAN), and the NSF. TransPAC Pacific Wave 100G will support multiple direct 100-gigabit connections to the US Department of Energy's high-speed networks, the Energy Science Network (ESnet), and Internet2. These ultrafast connections will deliver data transfer speeds that are 10 times faster than current rates to researchers between Asia and the US. To put this in perspective: If a US scientist downloads several hours of ultra high-definition 8K video from Tokyo, what had previously taken more than one hour can now be done in less than 10 minutes. Konishi also expects the TransPAC Pacific Wave 100G to play a role in big data exchanges in projects at the Large Hadron Collider, Belle2, the Atacama Large Millimeter/submillimeter Array (ALMA), and the Thirty Meter Telescope (TMT) in Hawaii. The new link will also provide the possibility for Japanese professors to join the the NSF-funded Pacific Research Platform project led by the University of California, San Diego and University of California, Berkeley. Our research network links, fast as they are, will soon be insufficient to support large-scale science, and with faster flows of data will come faster discovery. Bandwidth is important, but is only one facet of solving the world's hardest problems. International cooperation among the scientific community is the greatest result of the TransPAC Pacific Wave 100G network. Open, fast, and safe research networking for the world is fast becoming a reality. Read Ceci Jones's TransPAC Pacific Wave 100G press release here.